Navratri is a famous Indian festival, which involves fasting, feasting, and celebrations. So, make sure you surprise your family and loved ones this Durga Puja by trying out some delicious recipes. The festival of Durga Puja brings with it not just the beautiful pandals and vibrant colors but also an insatiable hunger, making the whole country one big food mela. As everyone gears up to celebrate this pious festival, make sure you are not missing out on some of the must have dishes. Basanti Pulao: Flavoured with purified butter or ghee and turmeric, drizzled with cashews and raisins this sweet pulao is an authentic Bengali delicacy that you can't have just once! Beguni: Fritters made of thinly sliced brinjal is the crispy starter no Bengali can do without during festivals. Its crispness comes from a batter of gram flour which has a medium consistency. Mutton Curry: Piping hot curry with big halves of potatoes and well-cooked, juicy pieces of mutton can take all the stress away from weary hearts. Prawn Malaikari: Succulent prawns cooked in a thick, mildly spiced, gravy of coconut milk, tastes like heaven on your tongue. Payesh: The Bengalis consider Payesh or their special rice-pudding to be one of the five Amrits. It consists of lots of cashews and raisins to the delight of kids and elders alike. Biryani and Korma: Festive cravings are incomplete without one of the most delicious and staple dishes - biryani and korma. Be it Hyderabadi, Lucknowi or Kolkata-styled, the juicy pieces of chicken smothered in thick creamy gravy, and savory rice is food-heaven, indeed! Baked Chicken Seekh: For this festive season, you need not worry about the weighing scale while treating yourself to scrumptious food. You can be absolutely guilt-free with baked tender and flavorful chicken seekh kebabs that are low on calories but high on deliciousness! Paneer Malpua: A rich aroma lingers everywhere on celebratory occasions such as these, and you just cannot miss out on this very tempting yet easy to make dessert. You can even pair these malpuas with rabri to add a mouth-watering twist! Shakarkandi Chat: A tangy and sweet chaat is prepared by roasting the sweet potato and then it is mingled in chaat masala and lime juice, later savored as a healthy snack. This recipe comprises of sendha namak, so can be cherished during the fasting. Chef Anoop Paul shares some 'upvaas friendly' Lipton Green Tea recipes for people who are fasting for nine days during the Navratri festival. 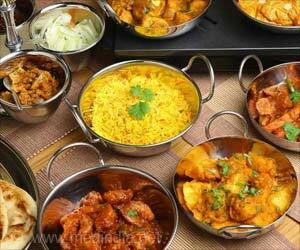 Chefs have put together interesting recipes for those observing the nine-day Navratri fast. Cookies, vegetarian 'mock duck', Parsi 'malai kulfi' and much more. Plan your navratri fast to not only detoxify your body but to also to keep your body strong and fit. Here are few tips for smart eating during navratras. 98fit, first of its kind Intuition driven Lifestyle & Wellbeing coach, has introduced a special diet for the health conscious fasting users for Navratri.